The app world is still racing at a roller coaster pace. This applies to mobile apps as well as web apps. Meanwhile people are becoming aware of the positive impact apps have on their business. And that is just what many traditional businesses needed to start investing in apps. Nearly half of UK and American adults check their bank accounts via their smartphone. The banking sector thus undertook action. They had to. It's a sector that can serve millions of clients directly, without personnel at a counter. You don't make a difference anymore by just having an app. You do it by having an app that makes a difference for your user. An app that delights by offering a better user experience than your competitors. We can achieve that by adding killer features and with good design. Two things that go hand in hand. Design is no longer something that we add on top to enhance the product. Our Concept & Design team follows the design community closely. The insights gained there can also be useful for project managers, developers, business,… We noticed however that it's hard for an outsider to stay up to date. We started this monthly blog series to give you an overview of visually strong, but mainly good designs. Your feedback is welcome! How do you collect the most important data, and make it clear and attractive? The example shown above is going in the right direction. Clean and clear. Background colors are used to divide the UI in different sections. By leaving out unnecessary decoration, the focus is really on the content. This is an interesting redesign project. The Nest app is well-designed and convenient in itself. But this is a great example of how relatively small adjustments in the UI and transitions can improve the experience. For example the resizing animation of the temperature dial when scrolling down, as shown above. Make sure to read the blog post that includes a video of how the new UI would work. Robin Hood app is a new and minimal looking trading app. When the stock market is open, you see a light UI. When the stock market closes, the UI becomes dark. This gives users information about the current status at a glance. Smart! Who said refresh-animations should be boring? Why not show a custom animation relevant to the app’s theme? It's details like these that make users smile. The toolbar shown here uses an interesting combination of icons and text. Using icons only, is compact, but can be unclear. When using text-only is very explicit, but the screen gets crowded real quick. So this solution combines the best of both worlds. A detail at first sight, but by using this technique two extra categories can be shown. What we will see more of in 2015 are animated buttons. (Why reload a page when only a small part has to be refreshed? This technique is also nice to use when sending forms. 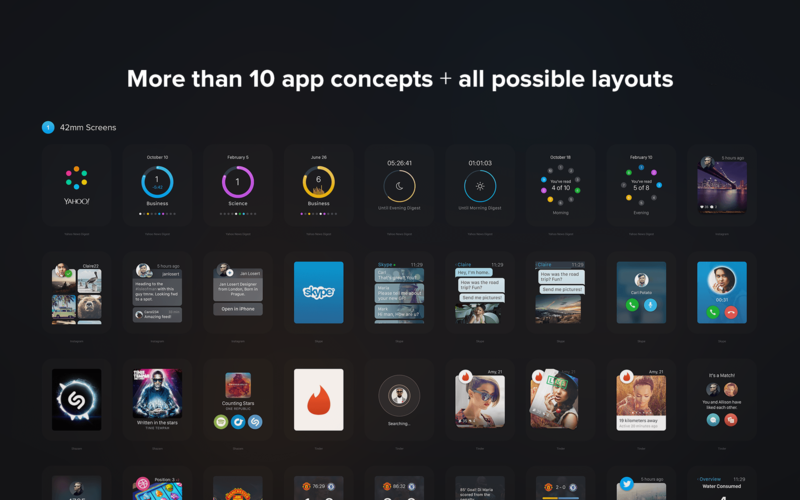 Invision, the well-known prototyping tool is preparing a new version of their design. Did you notice the influence from Google's Material Design? (hint: floating plus-button). Great example of a UI where you can perform multiple actions without leaving the screen. Left or right swipe does the trick. These actions are difficult to discover, so have to be learned the first time. But once a user has learned them, they speed up interactions incredibly. As no extra buttons are added to the screen, they also keep it clean. Not an app, but a website. So refreshing that we want to show you this one too. Play around with the menu. Rally Interactive is a digital studio, so they know what they are doing. Curious about how the UI of some of the well-known apps would look on an Apple Watch? Check out this Sketch resource. Slack wants to confine e-mail to the history books. And it's doing it at a fast pace. Half a million users in a year's time, amongst them some big names. The details are well thought-through here. Teams that work together remotely, live in different time zones. Slack knows that, and warns you before you wake up people accidentally, as shown in the example above. This is a preview of our new iCapps Care Dashboard. We made it responsive so it can adapt the full width of the browser. Handy, especially when users display it on an extra large screen or TV. We use two data sources: one for real-time data and one for an overview of today’s data. They are separated visually because they aren’t refreshed at the same rate. Combining them in one clean dashboard was a bit of challenge. The last one is a service without an app. No design. Strong. 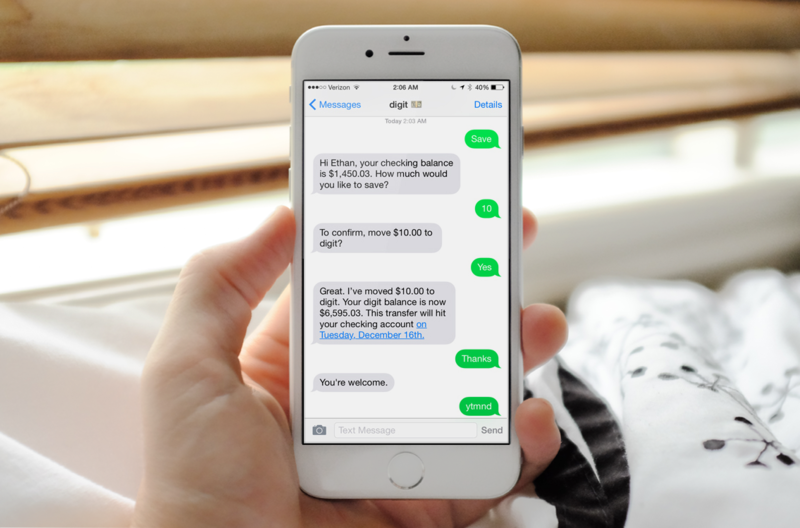 Digit is a service that helps you save money to your savings account. By studying your expenses, it will send you an SMS once in a while to ask you to save money. Precisely when it is convenient for you. So good design is also possible without a UI.